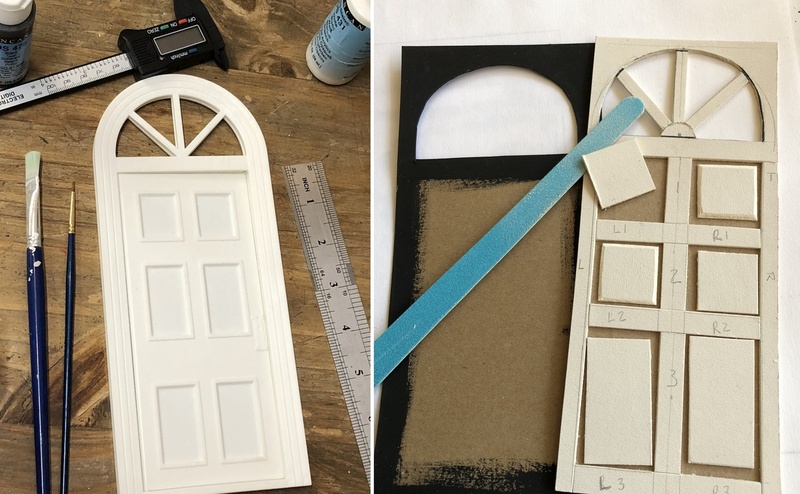 Megan's Tiny Treasures: Hold the Door! I love how your door looks! Maybe prime the card stock with gesso before painting? And while I usually don't mind spiders, and find tarantulas interesting... something about all those little guys just gives me the shivers. I hope they all grow up healthy. But they still creep me out. I have no idea why. Dear Sheila. Thank you for your comments on my blog during 2018. I loved reading them, and I loved visiting your blog. Your contest build was breathtaking and I'm always amazed at the dedication with which you work out every little detail. Looking forward to sharing your creative journey this year! The 'nowhere' door is fabulous. It is amazing how the room has been transformed by it and the bit of light coming through the fan light. I love it. Aah Megan, kyk hoe mooi kom jou huis aan. Al is ek skrikkerig vir spinnekoppe - storie oor jou tarantulla en haar babas is baie interessant. The door may lead to nowhere, but what an adventure it was getting it in there! It came out lovely, and I love that it is modeled on the real life gorgeous door to your studio. No matter where the next door leads you, you'll have a reminder of what you enjoyed while waiting to get there. Congratulations on such a successful egg sack, and on selling nearly all of them so quickly! It's going to be so rewarding for you to see the new babies become healthy adults! It's all so fascinating to read about! So far I've heard the Talking Heads sing about the road to nowhere… but I like your door to nowhere better (although I'm not sure about the cat… maybe you should think about a cat door to nowhere? *LOL*) The door turned out awesome - but even more awesome was that picture with the look through the window. It was fascinating and interesting to learn about your tarantula babies - an egg sack of 5 cm with 780 babies… Mother Nature is incredible! It's great to hear that all of them were sold and will get into good hands helping to safe this endangered species. Best wishes for this special door to be the right one! Hello, Megan - I love that the Nowhere Door has the potential to lead Anywhere that one might want to go. The door turned out beautifully - and how could it not, with such a handsome Real Life door as a model? I admit that while I'm not afraid of spiders, I do feel squeamish looking at them - but I pulled up my bootstraps so that I could show my two visiting grandsons your tarantula post. They were extremely interested and had many questions and comments, so it was worth some secret shudders on my part just to see their enthusiasm. Thank you for helping to save these tarantulas. Dear Marjorie. Thank you for your comments on my blog during 2018. I loved reading them, and I loved visiting your blog even though you, like me, don't seem to have so much time for writing. Looking forward to sharing your creative journey this year and giving a spider update every once in a while! Regarding your babies, I 'm happy for you, but the idea that they multiply so abundantly makes me shiver. Dear Ersilia. Thank you for your comments on my blog during 2018. I loved reading them, and I loved visiting your blog and seeing your Facebook posts. We seem to like many of the same things! Looking forward to sharing your creative journey this year. This was such an interesting and informative post! The fanlight in your door allows in some additional light whilst the door gives the hallway a sense of extention and mentally draws the viewer futher down the hall, towards the intersection. You did a Marvelous job of duplicating your RL door so a BIG HIGH 5 to you!!! About the baby spider; Ugg. I try to like them because I realize that they are one of GOD'S creatures and that they serve a purpose in the grand scheme of things but they still creep me out. Yay babies! They are adorable :) Congratulations! Please keep us updated. Are you on instagram? Your door to nowhere and everywhere turned out great. I need a door right now, perhaps I’ll make a mini for inspiration. Dear Keli. Thank you for your comments on my blog during 2018. I loved reading them, and I loved visiting your blog. Your winter cottage project turned out stunning, I'm in love with the exterior. The boats you've been working on lately are also inspiring. Looking forward to sharing your creative journey this year! Thank you for your comments on my blog during 2018. I loved reading them, and I loved visiting your blog. Yep, little spiders are not for everyone, even if they are miniature :-) Looking forward to sharing your creative journey this year! Love your door Megan.. The baby spiders.. not so much.. :D But the do still fascinate me in a morbid kind of way. I'm glad that you had a string of happy coincidences that made the door fit perfectly in its place. You would never know it was card. I know what you mean about card.. I have a love hate relationship with it. It's much easier to cut but the warping.. no fun at all. I do agree, putting it under weights does help. Dear Sam. Thank you for your comments on my blog during 2018. I loved reading them, and I loved visiting your blog. I think we both had sad experiences last year, but I'm happy to see that you are writing again. Looking forward to sharing your creative journey this year! We need an update....with lots of baby pictures!